"No matter how lost we feel in the tangle of our circumstances, even there the favor of God will find us out to do us good." -- D. Brown"
Continuing down memory lane with older photos of me ... this is the last one I have and I can't say I remember much about. It's a photo that was amongst many others in my mother's cedar chest when she died. I would imagine I was about 3 or 4. 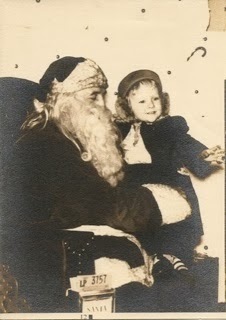 I don't remember being on Santa's lap, so it must not have been an annual thing. I do remember leaving cookies and a glass of milk for Santa on Christmas Eve before I went to bed. What I remember most about Christmas time was all the holiday music everywhere you went and the town being decorated on many streets with lights. I grew up in a small town. It is this vital union with Christ that is necessary in our lives. We must stop our struggling to become "like Him." The miracle of His grace is not merely what He would do for us, but what He would become in us. Maturity is not the development of human understanding; neither is it an increase in our intellectual knowledge concerning prophecy. It is, however, the unhindered outflow of the knowledge of Christ Himself, giving us understanding of the heart commensurate with our spiritual ability to receive Him. 'He that believeth in (into) Me, out of his innermost being shall flow rivers of Living Water.' (John 7:38) The surge of this Divine Flow or Resurrection Life will cover body, soul and spirit; and the Divine virtues of our adorable Lord will nullify and abrogate absolutely everything we have received under the Curse of the Law. This provision includes healing. It means more than healing; it is the perpetuation of health! It means the continuous operation in us of the Divine Life." We still do not have the usual flock of Dark-eyed Juncos so it is a mystery. I see one or two at a time feeding with the many White-throated Sparrows. One day I saw a Ruby-crowned Kinglet which is a bird we get during it's migration south. It seemed to be a little later than other years. We still have our deer families coming through daily. Water is so critical for wildlife in winter in areas where it freezes. I'm sure we have all kinds of night wildlife strolling through for a sip at our pond or to check on whether the last visitor left any of the veggie and fruit scraps we throw out each day. When I think about how much food is thrown out in the garbage that could help wildlife survive, it's a sad thing. But then some of that "garbage" is not what you would want to feed wildlife. 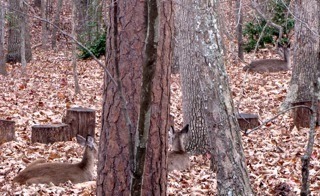 One of the deer families seems to come right after I put out cracked corn for the ground birds. I don't do it at the same time each day, so I am beginning to wonder if they hear me toss it to the ground. I throw it into the bushes that are at the breakfast window so the deer can't just eat a pile of it off the ground, but they still stick their noses under those bushes and get a few licks. After that they like to lie around in the backyard. Can you see the three (3) deer in this picture? Their coats are sure colored to blend in with the dried leaves on the ground. One day while they visited the two young ones decided to clean each other. That was so sweet. View Video of Two Young Deer Cleaning Each Other. I've been reading about critters in Australia since our neighbors took a trip there this year and brought me back two books on wild critters. 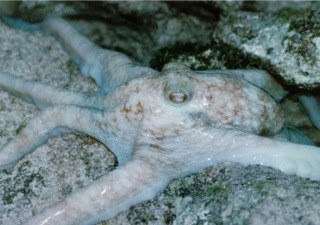 One was on ocean critters where I discovered a lot about octopuses. They live mostly on the floor of the ocean or among coral reefs. Did you know they are more intelligent than a dog? 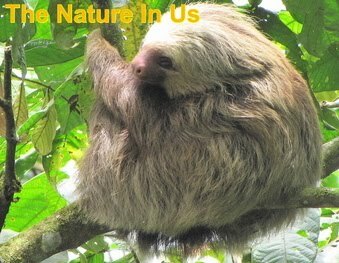 They have terrific short and long-term memory and a highly developed nervous system. They feed on some things with hard shells and break them by force or by drilling a hole in it and extracting the soft-bodied creature inside. One of the ways they escape danger is to squirt what looks like black ink, which is actually melanin. That's the chemical that gives us our hair color and skin color. Since I have vitiligo (lack of pigment in patches on my body) I'm very familiar with that chemical's name. Octopuses are skilled problem solvers. There have been reports of octopuses boarding fishing boats and opening holds to get at the crabs. The most bizarre information about this critter is that when it reproduces, it dies. Males live for just a few months after mating, while females stop eating as they tend their eggs and eventually starve to death. So, now you have a little knowledge about octopuses. I don't expect to find any here at Bluebird Cove. 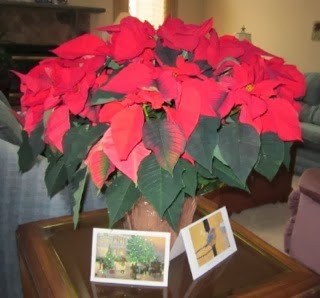 We happened upon some huge poinsettias for $14.99 earlier this month. I've never seen any this big and they looked so healthy and lush. Couldn't resist such an alive looking plant in the midst of a dreary winter. So I picked out the best one [grin] and Randal put it in the cart. You can kinda see from the couch behind it that it's the width of it. The angle I shot at isn't allowing for much viewing. When I visited Costa Rica they grow as trees. When we lived in Alabama I actually planted one after the holidays and it lived for a couple of years until we had a hard winter. So, our home looks like Christmas with our 16" fiber-optic tree on the fireplace and this poinsettia on the end table by the front door. I talk to it every day telling it how beautiful it is and how long it's going to live and be honored in our home. An elderly professor of world religions surprised his colleagues by declaring his commitment to Christ. 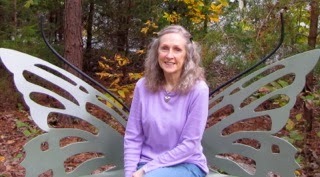 He explained: "It was as if I had fallen into a deep, abandoned well. Muhammad came by and told me it was the will of Allah that I be in this well, then he left. The Buddha came by and told me if I would cease desire I would cease to suffer in the well, then he left. A Hindu teacher came by and told me if I was faithful in the well I would escape through reincarnation, then he left. Confucius came by and told me if I'd not tripped I would not be in the well, then he left. Jesus came by, saw me, and got into the well with me. 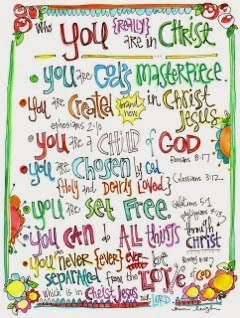 That is why I am a Christian." With all the busyness in the month of December, I made this issue shorter than usual. There are many festivities to enjoy for Christmas. I pray you keep peace in Christmas and your "to do list" short. I'm already praying for your new year of 2014 with blessings of provision, health, relationships and more depth of understanding of the love of God for you. Have a truly merry Christmas in Him. How to Find a Lost Dog: Keep This Info!